Aluminum is corrosion resistant and light weight. It has a lower structural stiffness than steel (about 1/3), which must be compensated for by thicker gauge. Typically, stainless steel fasteners are used with aluminum. However, in some cases, zinc-plated fasteners are used, depending on the application. Additional Notes for Fasteners with Aluminum: Aluminum fasteners are very soft and therefore have low physical durability. As a result, we do NOT stock them. However, there are some applications where they are useful, such as parts that have service in corrosive liquids such as salt water. Other combinations of dissimilar metals can cause galvanic corrosion. 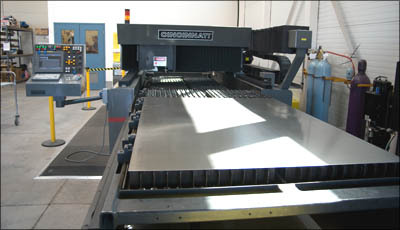 5052 Aluminum is optimal for sheet metal work and is very easy to form at room temperature. This material is very bendable, and can therefore handle tight radii. A non-heat treatable alloy, 5052 aluminum is readily welded by conventional methods. It has good forming characteristics and good corrosion resistance, including resistance to salt water. 5052 aluminum is also relatively easy to machine. Note: See caution on gauges. (0.250" | 6.35 mm) ± 0.014"
(0.188" | 4.78 mm) ± 0.009"
8 gauge (0.1285" | 3.26 mm) ± 0.007"
10 gauge (0.102" | 2.59 mm) ± 0.006"
11 gauge (0.091" | 2.31 mm) ± 0.0045"
12 gauge (0.081" | 2.06 mm) ± 0.0045"
14 gauge (0.064" | 1.63 mm) ± 0.0040"
16 gauge (0.051" | 1.30 mm) ± 0.0035"
18 gauge (0.040" | 1.02 mm) ± 0.0035"
20 gauge (0.032" | 0.81 mm) ± 0.0030"
(0.1285" | 3.26 mm) ± 0.007"
(0.375" | 9.53 mm) ± 0.017"
(0.500" | 12.7 mm) ± 0.023"
Note: Gauges are typically not used when specifying aluminum as the actual thickness of the aluminum is more internationally recognized. It starts at sheet by thickness and migrates into plate at the thicker end of the scale.